Classes 7 days a week for all levels. A fully equipped Iyengar yoga centre in the heart of Marrickville. Experienced highly trained, engaging and knowledgable teachers. Find the right class for you. Download a copy of our full timetable here or scroll down to check below for most up to date information. 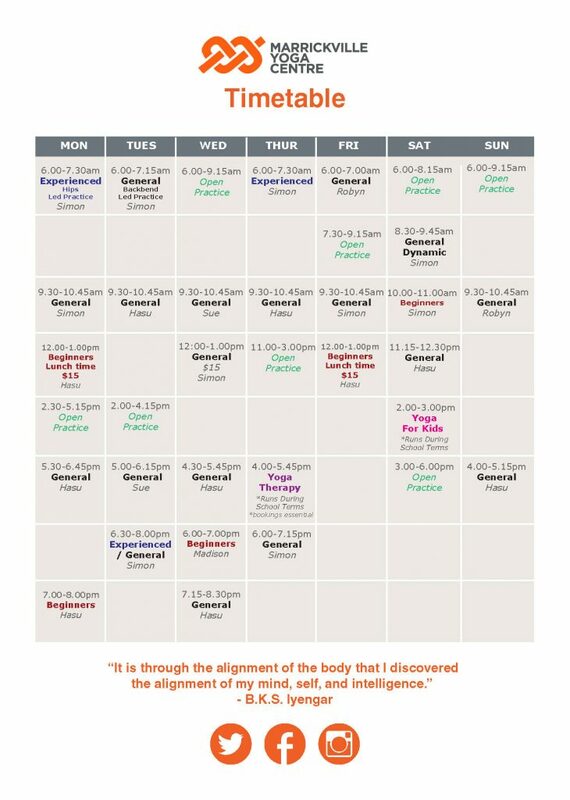 New to Yoga, wanting to get back into practice or those who have no Iyengar Yoga experience. Book the 6 week Unlimited Beginners Pass here. Students who have completed a Beginners course at The Centre, have experience from another Iyengar school or come from a different method of Yoga. Inversions are practiced in this class. Students have been attending The Centre for a number of years & are starting to deepen their practice. Students are work with inverted variations, backbends & pranayama. Familiarity and regular practice of all of the inversions & backbends is essential. Time for regular students of the The Centre to do their own practice. Key required. Specific programs for injuries. No Yoga experience needed. Bookings essential. Private and corporate classes can be arranged upon request. Classes can be one off or regular depending on your needs. Please get in touch via email for availabilities & prices. Click here to go directly to PunchPass where you will be able to view your pass and attendance history. If you have not already created a PunchPass Account, you will be able to do so.